Beginning with the most fundamental question of all, Grignon asks: Where does money come from? The answer to this question will almost never be found in grammar school-or even college. What we aren't told in formal education is that money is created by central banks. Banks create money, not from their own earnings or from the funds deposited by customers, but from the borrowers' promises to repay loans. Most importantly, borrowers not only promise to repay, but to repay with interest, and the bank writes the amount of money of both into the borrower's account. Grignon opens with a story from antiquity. In the days before paper money, goldsmiths produced gold coins and kept them safe for the purchaser in the same way that banks hold deposits today. These goldsmiths soon noticed, however, that purchasers rarely came in for their actual gold and almost never all at the same time. So the gold merchants began issuing claim checks for the gold which made the exchange of gold in the marketplace easier and less cumbersome. Thus, paper money was born which made doing business much more convenient. Eventually, goldsmiths began loaning money to customers and charging interest on the loans, and borrowers began asking for their loans in the form of claim checks. The goldsmith shared interest earnings with depositors, but since no one actually knew how much gold he was holding, he got the idea that he could lend out claim checks on gold that wasn't actually there and soon started becoming enormously wealthy from the interest paid on gold that didn't exist. Thus began the power to create money out of nothing, but it wasn't long before bank runs began, and banking regulations evolved regarding how much money could be lent out. However, the regulations allowed a ratio of 9 to 1-that is, banks could lend out 9 times the amount of the deposits that were already there. This policy has come to be known as Fractional Reserve Banking. Regulation also arranged for central banks to support local banks with emergency infusions of gold, and only if there were many runs at once would the system crash. Fast forward to 1913 when that so-called progressive president, Woodrow Wilson, signed into law the Federal Reserve Act which created the banking cartel now in charge of America's money system. 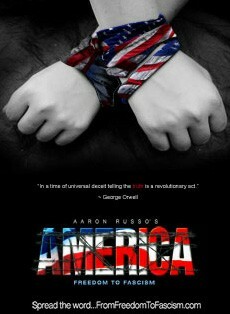 For those who have not seen Aaron Russo's DVD "Freedom To Fascism" - run, don't walk to see or purchase it. It is required viewing for understanding the Federal Reserve System and the power it has over the U.S economy and over our individual lives. Very few Americans know how money is created and even fewer know how the Fed originated and what it actually does. Does anyone really believe this is an "accident"? As the media guru Marshall McLuhan is reported to have said, "Only the small secrets need to be protected. The big ones are kept secret by public incredulity." One wonders how individuals, banks, governments, and other entities can all be in debt at the same time, owing astronomical amounts of money. This question is answered when we consider that banks don't lend actual money; they create it from debt, and since debt is potentially unlimited, so is the supply of money. But what is so wrong with this scheme? Hasn't it been working all these years? Actually, there are several things very wrong with it. Most of us have been taught that paying our debts responsibly is good for ourselves and for the economy. We imagine that if all debts were paid off, the economy would improve. In terms of individual debt, that's true, but in terms of the overall economy, the exact opposite is true. We are continually dependent on bank credit for money to be in existence-bank credit which supplies loans. Loans and money supply are inextricably connected, and during the Great Depression, the supply of money plummeted as the supply of loans dried up. Secondly, banks only create the amount of the principal of loan. So where does the money come from to pay the interest? From the general economy's money supply, most of which has been created in the same way. A visual image is helpful. Imagine two pools of water-one full and one empty. The pool with water in it represents the amount of the principal of a loan; the empty pool represents principal plus interest. The pool of principal has only a certain amount of water in it, so that it can't possibly fill up the other pool of principal plus interest. The rest of the water needed to fill the pool doesn't actually exist and has to be acquired from somewhere. The problem is that for long-term loans, the interest far exceeds the principal, so unless a lot of money is created to pay the interest, a lot of foreclosures will result. In order to maintain a functional society, the foreclosure rate must be low, so more and more debt must be created which means that more and more interest is created, resulting in a vicious and escalating spiral of indebtedness. Furthermore, it is only the lag time between the time money is created to the time debt is repaid that keeps the overall shortage of money from catching up and bankrupting the entire system. It takes only a few second of reading the headlines of the financial pages during this month, August, 2007, to notice that foreclosure rates and lag time are threatening to meltdown the entire U.S. economy. The preferred method of the Federal Reserve and central banks addressing this calamity is, yes, you guessed it: to create more debt. The lowering of interest rates in recent years, the bombardment of credit card applications we find regularly in our mailboxes, the red ink in which the United States government is drowning are all an attempt to stave off the collapse of the entire system. One thing to realize about our fractional reserve banking system is that, like a child's game of musical chairs, as long as the music is playing, there are no losers. 1) Why do governments choose to borrow money from private banks at interest when governments could create all the interest-free money they need themselves? 2) Why create money as debt at all? Why not create money that circulates permanently and doesn't have to be perpetually re-borrowed in interest? 3) How can a money system, dependent on perpetual growth, be used to build a sustainable economy? Perpetual growth and sustainability are fundamentally incompatible. 4) What is it about our current system that makes it totally dependent on perpetual growth? What needs to be changed to allow the creation of a sustainable economy? A crucial assumption that must be questioned is the practice of usury or the charging of interest for lending money. Grignon asserts that it is a moral and a practical issue because it necessarily results in lenders ending up with all the money, particularly when foreclosures happen. Not only is debt deplorably profitable for lenders in terms of interest and service charges, but when borrowers cannot pay, as in the case of housing foreclosures, lenders walk away with the proceeds. In a recent article "Panic On Wall St.", Andrew Leonard explains how obscenely advantageous subprime and liar loans have been for lenders and provides damning evidence to support the long-time assertions by Catherine Austin Fitts that the housing bubble has been engineered by centralized financial systems. In a transformed economy, which I do not anticipate happening in the twenty-first century, banks would exist as non-profit services to society-lending without charging interest at all. But, as Grignon says, if it's the fundamental nature of the system that's causing the problem, then tinkering with the system can't solve the problem. It must be replaced. Perhaps the best solution offered by "Money As Debt" is the creation of locally-based barter money systems in which debt is repaid by hours of work valued at a dollar figure. Additionally, government spending on infrastructure, not using borrowed money, would also create value locally and nationally. Whoever controls the volume of money in our country is absolute master of all industry and commerce...when you realize that the entire system is very easily controlled, one way or another, by a few powerful men at the top, you will not have to be told how periods of inflation and depression originate. "Money As Debt" is not only a must-see for any American who wants to be politically and economically literate, but is particularly crucial for high school and college students to see in order for them to understand how the money works in the United States. Yet we should not assume that the film's simplicity of presentation ranks it as less than adult because most adults in this nation are clueless regarding the connection between money and debt. I personally hold no hope of changing the money/debt system which is truly the eight-hundred-pound gorilla in the American economic landscape. What I do envision, and what must happen, in my opinion, is its total collapse, whether gradual or sudden, so that the transformation and relocalization of the nation's economic system will be possible, which it is not in the current milieu. However, what we are presently witnessing in the bursting housing bubble and credit crisis may well be the beginning of the end of "money as debt." andy gause made a shocking statement on the current financial dilemma. I am SHOCKED!!! This is a must see everyone!